Numerous plant diseases impact fruit crops throughout Kentucky. Factors such as plant growth stage, as well as rainfall, temperature, and other weather conditions, can be used to determine risk for plant disease. Disease prediction models can aid growers in assessing disease risk and timing pesticide applications. Using prediction models can provide growers with cost savings, as unnecessary chemical applications are eliminated when risk of infection is low. This publication provides practical information on using the University of Kentucky Agricultural Disease Prediction Models by providing screen shots that display each step. 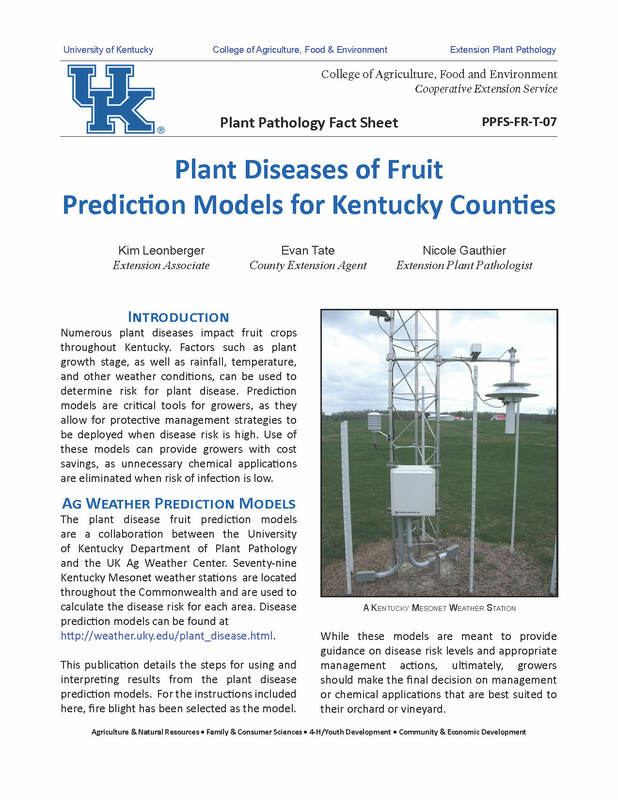 Plant Diseases of Fruit Prediction Models for Kentucky Counties (PPFS-FR-T-07) is available online. For additional publications on fruit diseases, visit the UK Plant Pathology Extension Publications webpage.